So — as recorded in M. Stanton Evans' new book Blacklisted by History — Senator Joseph Raymond McCarthy was censured (or "condemned") by the Senate on December 2, 1954. After the hue and cry had died down, the IRS sent the senator a check in the amount of $1,056 as a refund on the ground that he had overpaid his taxes. Thus crumbled the case against the senator by the Gillette committee. That panel had scoured McCarthy's finances going back to his days in law school, and even included the finances of members of his family and friends in Wisconsin and elsewhere. The senator's contemptuous attitude toward that fishing expedition was one of the reasons for his censure two to three years later. McCarthy used the occasion of his tax refund to say that the censure resolution had been discredited. Not at all, retorted Ike's lapdog Arthur Watkins, who chaired the committee that had recommended the censure. But Lapdog had political problems back home. 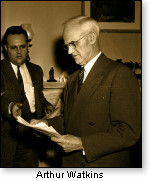 Utah's former Governor J. Bracken Lee, a supporter of McCarthy, ran against Watkins as an independent in 1958. In an overwhelmingly Democrat year, neither man won that battle — though Watkins, who thus made an involuntary exit from the Senate, was seen as the biggest loser. Brack Lee went on to become a three-term mayor of Salt Lake City. A grateful President Eisenhower appointed Watkins to a plum assignment as a member of the U.S. Indian Claims Commission, where he served eight years. Beyond that, the Utahn — if reported conversations with others are any indication — lived out the rest of his life as a bitter old man. In 2003, the Senate's "50-year rule" led to the release of a nearly 5,000-page document dump in the form of the closed-door sessions of the Investigations Subcommittee during McCarthy's chairmanship in 1953-1954. As mentioned previously, Sen. Susan Collins (RINO Republican-Maine) chaired the old subcommittee when the green light was given to release the testimony. She and other key members held a news conference to impose their spin on the transcripts before anyone else beyond the committee had had a chance to read them. In announcing the release, Collins quoted approvingly an anti-McCarthy comment made by one of her Maine predecessors, the late Senator Margaret Chase Smith (in the fifties also RINO Republican-Maine). But one Smith quote Collins did not acknowledge is cited in Evans' book. When Senate investigators were sent out to "get the goods on McCarthy" on his Wheeling speech in the fifties, they came back with a report that supported McCarthy, not his enemies. Smith's response, as an investigator later reported, was that "we should forget about it." No doubt, Senator Collins is displeased with the new 663-page Evans book that documents — chapter and verse — the lies perpetrated by those who trash McCarthy today. Perhaps Mrs. Collins thinks "we should forget about it." 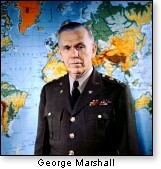 Not everyone who supported McCarthy was with him in the senator's 1951 marathon Senate floor denunciation of General George Marshall. To some extent, Evans is among conservatives who fall off the sled on that one. Personally, I read McCarthy's book America's Retreat from Victory (an expansion of the speech) and found it quite compelling. "So did I," said Evans in our interview, adding that there was no doubt that Marshall was culpable in that — as Truman's Secretary of State — he "allowed things to happen [that he] should not have allowed." When I noted there was no record of Marshall's protesting or complaining of outrageous things he was ordered to do, Evans agreed, but added McCarthy erred in saying the general always and every time made the wrong decisions. Ronald Radosh wrote a very bad and distorted review of Evans book — a review which conveyed an out-and-out falsehood that Evans supported "McCarthy's outrageous assertion" about Marshall. As indicated in the above paragraph, that is not the case, though my own reading of America's Retreat from Victory" is that the thrust of Marshall's involvement in foreign policy disasters is what was "outrageous." We will have more to say about that and other reviews of the book in a future media-centered report for Accuracy in Media (AIM). Thus far — as this is written about a month after the book's release — Evans has been getting some good interviews, including several by radio talkshow hosts such as Glenn Beck. By and large, the mainstream media is giving Blacklisted by History the silent treatment, a tactic they will use unless and until the content of the book spreads so far and wide and as to threaten the undoing of their carefully crafted and totally biased rendition of history on the McCarthy investigations. If that happens, expect the smear treatment. I've seen that happen before. This is where I came in. As we mentioned in Part 1 of this series, Evans found that some files on McCarthy's investigations were missing from the archives. This included files withdrawn as late as 1993 and (discovered after Evans' book went to press) in 2000. Both were during the Clinton administration. Evans tells me these withdrawals were "by the book," not by some clown-like Sandy Berger stuffing them in his pants and hiding them at a construction site. The question is: Who did the withdrawal and why? By the time we revisit the issue, we may have the answer. The 2000 withdrawal was an intelligence report on Gustavo Duran (one of McCarthy's first cases) who survived the senator's inquiries, thanks to the Tydings whitewash. Duran would stay on in a job at the United Nations where he was involved a decade later in a Kennedy administration disastrous policy in the Belgian Congo, according to the author in our interview. It so happened that though the file was withdrawn, Evans had his own copy which he had obtained from the late Ralph de Toledano. Still the question of why the file was withdrawn needs to be answered at some point. When Harry Truman left the White House, his approval rating was at 22 percent. He took a political beating in part for following the advice (of people later proven to be traitors) that we should throw in our lot with the then-insurgent Chinese Communists and turn our back on Chiang-Kai Shek. That policy — for which we are paying 58 years later — took an even more sinister and shocking swerve in the form of active plots inside the administration and the then-newly-born CIA to assassinate Chiang-Kai-Shek both while he was still in power on the mainland and after he had fled to Taiwan. Since then, Democrat party activists disguised as "historians" have cleaned up Truman's memory — which may be why it has been said that "history' is [often] bunk," written from the one-sided view of those with the loudest megaphones. The anti-communist side of Truman's reputation today lies largely in the fact that he tacitly acknowledged we could no longer abide the FDR nonsense of "good old Joe Stalin." As Evans told me, Truman was indeed "viscerally anti-Communist but easily manipulated, snookered, misled over and over again on all internal security issues." He even approved Harry Dexter White for Treasury despite a warning from the FBI. Japan: History that might have been? Evans goes into some detail about the Sorge spy ring in Japan prior to World War II. The German-born Richard Sorge, "perhaps the most effective secret agent in Soviet history [Evans' words]," helped foment Communist insurrection in China — with active assistance from those with connections to the (McCarthy nemesis) Institute of Pacific Relations (about which see Part 3 of this series and Stan Evans' book). Sorge also operated a first-rate spy ring in Japan, where he posed as a Nazi to give himself cover. His job there was to use his penetration of and influence with the Japanese government to turn the Japanese war machine away from any attack on Japan's historic foe — Russia — i.e., the Soviet Union. The success of the Sorge spy ring culminated in the Japanese attack on Pearl Harbor. Me: So the attack on Pearl Harbor was the result of a Soviet plot? ME: But the point is if they (Sorge & Co.) had not directed influence away from a Japanese war against the Soviets, there would not have been the attack on Pearl Harbor? Evans: There is that linkage, yes. By any standards of a regular column, this series has been voluminous. And yet, we have barely scratched the surface. There is so much in Blacklisted by History. You cannot begin to see the big picture until you read it. It is jam-packed with facts, reading like an entertaining encyclopedia. M. Stanton Evans has spent years in scholarly research — spurred on in large part by a focused desire to undo the liberal establishment's success in skewing the history of the "McCarthy era" to a dishonest version. This series ends — for now — but not necessarily forever. In legislative and judicial parlance, we will "keep the record open." We will focus on the media angle in at least two upcoming reports for Accuracy in Media (AIM), where we intend to bird-dog the mainstream (and even conservative) media's approach to the Evans book. There will also likely be follow-ups in the days, weeks, months, and/or years ahead right here at RenewAmerica.